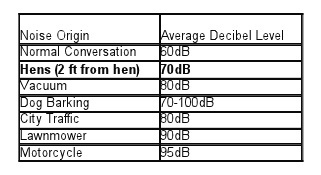 There are a lot of misconceptions about chickens- they’re noisy, smelly, attract rats, etc. This addresses them. Gruesome, I know. I don’t like looking at it any more than you do. So here’s the deal. Rats are everywhere. If you think you don’t have them… you likely do. I’d bet money on it. Not too much though, I’ve got rat traps to buy. When I first started this foray into keeping chickens, I faced a lot of criticism and concern over rats. There’s this misconception that chickens attract rats, which is patently untrue. Rats are attracted to food, plain and simple. Chickens are NOT food for rats, as a full grown hen is a formidable force and could easily kill and eat those little guys in the pic (not the big honkin’ one on the right hand side). As such, part of our ordinance dictates how you store feed for your chickens- always enclosed, always in a rat proof container. It’s essential that this is followed, and essential that your coop is built in a way that keeps rats OUT. So, if I’m following all those rules, why am I catching rats in my backyard? Note, for clarity: chickens do NOT attract rats (they actually predate rats) and chicken waste does not attract rats (chickens process food efficiently enough that the waste isn’t attractive like dog waste is). These suckers are tenacious, and I’ve been quietly catching them throughout the neighborhood since I’ve gotten chickens. I feel a personal responsibility to keep the population down, since I repeated ad nauseum that getting chickens wouldn’t bring rats into the city. I stand by that, and data is backing me up. The rat issue is far more widespread than I imagined. Data points are from 8/10-8/23/2016. That’s a LOT of rats. Yellow is a sighting, blue is a burrow or evidence, and red is a kill. People have said for years that they think they’re concentrated around the train line, and that’s clearly inaccurate. They are everywhere, not just by the train line, not just downtown by the restaurants. And these are just the ones being reported, by the people who know about the reporting form. Update 2018: I’ve been making the rounds across SE MI lecturing about rats. During the past few years I’ve killed thousands (estimated, since I don’t get an exact count when they get killed in burrows). Ferndale Rat Patrol is going strong, and neighbors are helping neighbors, with the end result being far less rats than I’ve seen in previous years. Chickens do not attract rats. Let me say it again: chickens DO NOT attract rats. Chickens will kill and eat mice, voles, and rats. Here’s what really attracts rats: food & safe places to live. Kinda like me. I just want a nice meal and warm house to curl up in, and to not fight about how chickens are drawing rats to our town. Rats are opportunistic feeders, and will eat anything that doesn’t eat them first. The reason I can safely say that rats aren’t drawn to the chickens themselves is because chickens WOULD eat them first. Don’t believe me? Do a search for ‘chicken eats mouse’ or ‘chicken kills rat’, or watch this video (WARNING: mouse gets eaten) of a chicken snatching up a mouse and running off with it to eat it. Chickens are mini-dinosaurs, and I firmly believe if they would eat people if they were bigger than us. 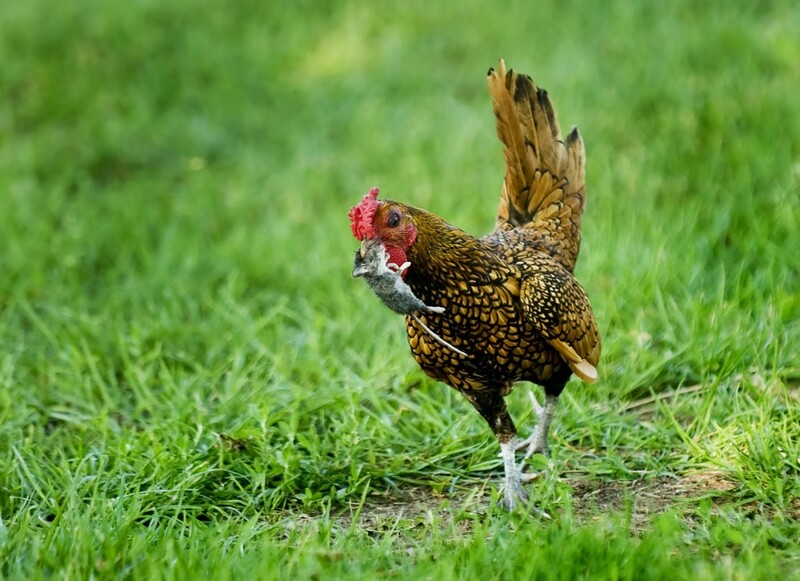 Photo credit: DAVID ZALAZNIK/JOURNAL STAR A rooster carries a mouse across a farmyard near Fairbury. Pet food outside = rats. Fruit dropping on the ground from fruit trees = rats. Untended compost heaps = rats. Piles of lumber on the ground = rats. Untended veggie gardens = rats. Know why you don’t see chickens on that list? Because rats are opportunists, not fighters. They’re not after chickens- a fully grown hen can mess up an average size wild rodent (chicks are another story, and great care should be taken to protect them). What they would be after, however, is the chicken’s food. That’s why our ordinance spells out that the feed must be contained, so as not to attract vermin. With proper management of stored food/uneaten food, this doesn’t become an issue. We’ve seen a far greater issue with unsecured dumpsters in the downtown Ferndale area attracting & feeding rats than we’ll ever have to contend with in properly maintained residential areas. If you are a chicken keeper, or want to become one, you need to know that rodents are a POTENTIAL problem. You address this by making sure nothing can get into your coop either by tunneling or climbing (rats will do both), and that feed is secured nightly. Rats can fall from a height of 50 feet without getting hurt. Rats can jump three feet in the air from a flat surface and leap more than four feet horizontally. Rats can chew through lead, cinder block, and aluminum sheeting. 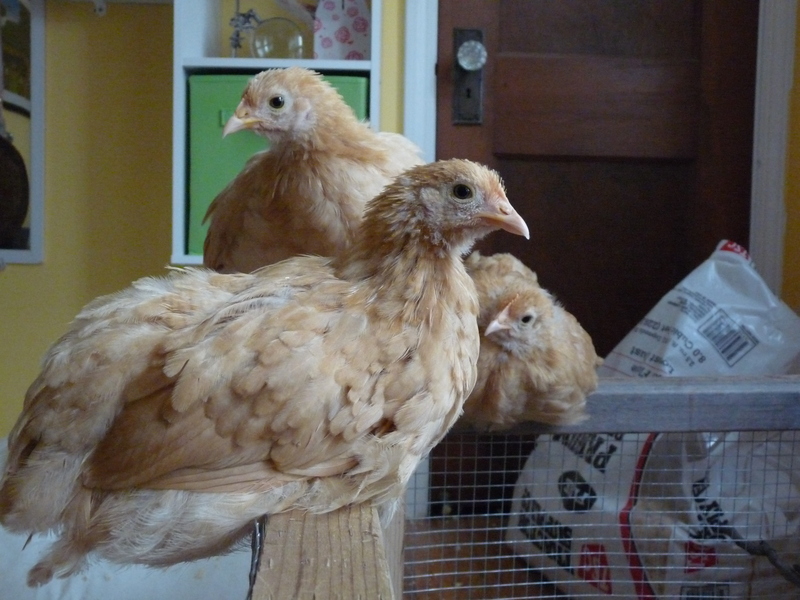 They’re amazingly smart & tenacious, and if they can get into your coop to eat the chicken feed, they will. Again, this isn’t the fault of the chicken- rats would just as soon come into your house and eat your groceries, if they could find a way in. If anyone in Ferndale has reason to believe they have rats, I urge you to contact me directly if you need help ridding your property of them. Many people have suggested releasing hawks in the area to combat the rodent population; the problem with that is that hawks hunt during the day, and rats come out at dusk and are active throughout the night. Your best course of action is snap traps or electric traps- they’re quick and effective, and don’t create secondary issues of poisoning in the food chain like rat poison does.